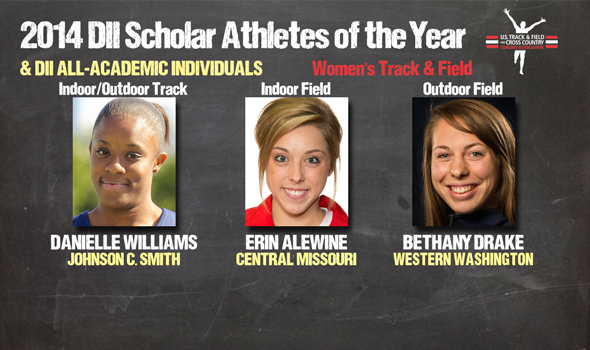 NEW ORLEANS – Danielle Williams of Johnson C. Smith, Erin Alewine of Central Missouri and Bethany Drake of Western Washington have been named the women’s Scholar Athletes of the Year in Division II for the 2013-14 track & field season by the U.S. Track & Field and Cross Country Coaches Association (USTFCCCA), the association announced Tuesday. Considering both their accomplishments in the classroom and in competition during the recently completed academic year, these three women were the most exceptional among a class of 422 who earned USTFCCCA All-Academic honors. The full breakdown of All-Academic selections can be found below. Williams, a senior business administration major with a 3.89 cumulative GPA, swept both the indoor and outdoor track Scholar Athlete of the Year awards following a season in which she won five individual national titles – defending her outdoor track award from 2013. The native of St. Andrew, Jamaica, is the third woman to have won the track award for both seasons since it first began in 2007, and is the first to have won the outdoor track award in two consecutive seasons. She won indoor national titles at both 60 and 200 meters and in the 60-meter hurdles, and claimed the 100 and 200 meters crowns at the outdoor championships. She was also just fractions of a second away from a 100-meter hurdles title. Alewine, a senior dietetics major with a 3.56 cumulative GPA, also repeated as a Scholar Athlete of the Year for the indoor field category. The Jefferson City, Mo., native won her second consecutive heptathlon title at the NCAA Indoor Championships to become the first woman to earn the indoor field award in two consecutive seasons. Drake, a sophomore art major with a 3.83 cumulative GPA, not only claimed the NCAA Outdoor Championships javelin title from Seton Hill’s Mallory Sanner, but also the outdoor field Scholar Athlete of the Year honor. She is the first woman from Western Washington to have earned Scholar Athlete of the Year honors. Including the Scholar Athletes of the Year, a total of 422 women from 99 institutions earned USTFCCCA All-Academic honors for their combined academic and athletic accomplishments. Grand Valley State led all teams by a wide margin with 21 honorees, ahead of indoor national champion Adams State and Minnesota State with 12 each. Five more teams reached double-digits in All-Academic representation. The MIAA led the way on the conference side with 70 awards won by its member institutions, followed closely by the duo of the NSIC and GLIAC with 66 and 64, respectively. Twenty-five different women recorded a cumulative GPA of 4.0. Haley Manning Northwest Missouri 3.85 Physical Ed.